Ahhh, Escape From New York. I loved this film as a kid – and looking at this preview, I think I need to watch it again. It may have been wrong on suggesting that New York would be a maximum security prison in 1997 but we won’t hold that against it. If you’ve not seen it, a plane carrying the US president is hijacked and crashes in New York, a place chock full of criminals. On the outside, the powers that be tap Special Forces soldier turned bank robber Snake Plissken on the shoulder and tell him to go in and save the president. He doesn’t want to but is persuaded by the fact that he’ll die otherwise. Snake is played by Kurt Russell in the performance of his career (yep, even better than Big Trouble in Little China) – made me wish I had an eyepatch, even if that wouldn’t have looked quite so cool on a fat 12-year-old boy. Anyway, what does a legendary 1981 movie have to do with beer? Well, my latest batch of homebrew goes by the name of Snake Plissken. That would be because it has a shitload of lolly snakes in it. In this case “shitload” is an ancient term meaning “almost three kilograms”. The inspiration came from the excellent Killer Python Kolsch I tasted at the Great Australasian Beer Spectapular. Brewed by True South, it carried the distinct aroma of Killer Pythons and had their flavour too, while managing not to be a sweet beer. Given that the beer was never going to be bottled my chances of ever trying it again was essentially nil. So I decided to make my own version, but with the help of whoever is at the other end of the True South Twitter profile. See I sent several tweets asking for tips on making something similar and they were quite gracious in helping out. 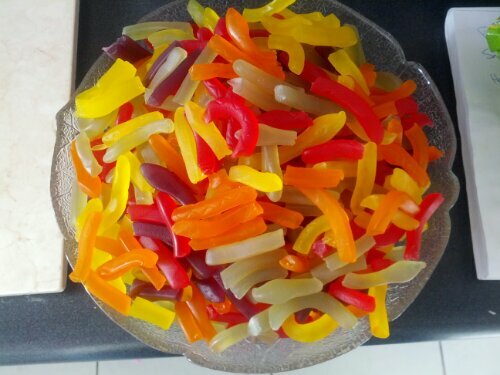 This is what 2kg of lolly snakes looks like after you cut them up in preparation for the boil. The big help was working out how much snakes to use – 2kg in the boil and another 1kg to dryhop. I ended up using 900g for dryhopping but that was only because I didn’t want to go buy another bag of snakes from Aldi just to get the last 100g. The base was a simple kolsch recipe I found online, something with minimal hops because I wanted the snake flavour to be dominant. To prepare the snakes I cut each of them into four pieces, figuring smaller pieces would dissolve faster in the boil. And they do dissolve, while giving a wonderful aroma that resembled Fruit Tingles. For the first week in the fermenter, the flavour was just want I wanted, if perhaps slightly too sweet. But then, once I dry hopped with more snakes, the flavour began to fade. I put that down to the fact that cool weather made the yeast sluggish – it took two full weeks to finish fermenting. Given the loads of sugar in the beer, I figured the yeast would go crazy muching all that. So today I bottled the beer – in the precautionary plastic bottles. The final gravity is 1026, which I’m thinking seems a bit high for something with 2kg of lolly snakes. So I’ve a few concerns that fermentation might kick in again once it’s in bottles, so I’ve opted for plastic rather than glass. Even though the last hydro samples aren’t showing a beer as lolly-flavoured as I’d like, I’m still confident I’ll end up with a drinkable beer. Not to mention a beer every visitor to my place will want to try. Because, if you tell someone you’ve made a beer with lolly snakes, who isn’t going to want to try that?